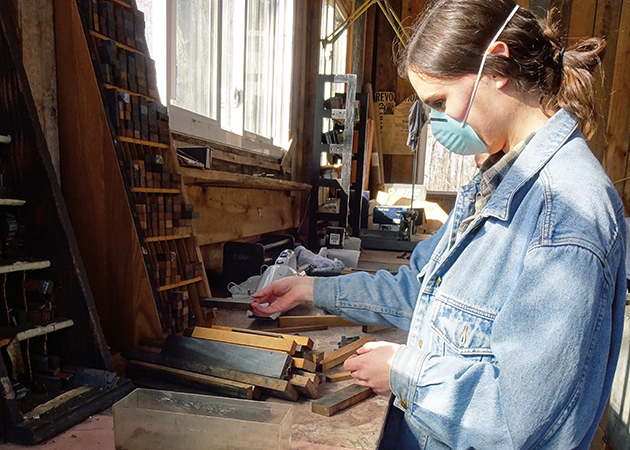 Over spring break, students traveled to Scioto County to take part in service-learning projects with community partners, including restoration of local poet Brian Richards’ letterpress, pictured here. “The researchers have been a delight: thoughtful, inquisitive, eager to learn, but equally respectful of my privacy as an artist and helpful in every encounter,” Richards said. Folklore isn’t all old wives tales and urban legends — it’s about documenting cultures and communities here and now. That’s why the Center for Folklore Studies (CFS) at Ohio State has been conducting an ongoing research project through its Ohio Field School, which focuses on Scioto and Perry Counties in Appalachian Ohio. Since summer 2016, CFS students, faculty and staff have been building relationships with core community partners in both counties and developing archival projects that support, document and preserve local culture. Here is just a glimpse of this work. Near the confluence of the Scioto and Ohio Rivers in the rolling foothills of Appalachian Ohio is the Shawnee State Park Lodge. Inside, Ohio Field School (OFS) staff and students spread butcher paper over banquet tables, assemble easels, check mics, queue PowerPoints and stock buffet tables. It’s a big day for the OFS, a collaboration between Ohio State’s Center for Folklore Studies and community partners in Portsmouth, Ohio. After two years of conducting folklore fieldwork in Scioto County, the OFS is in its early stages of curating a traveling exhibit designed to spark conversations centered around creative placemaking. Today, participants have invited local collaborators to provide feedback and think creatively and critically about contemporary life in Scioto County. This fall event is a hallmark of the OFS mission: to collaborate as a means of understanding how people see and create within their communities, and to facilitate conversation and give people a reason to gather. Fast forward to spring 2018: Cassie Patterson, assistant director of the CFS, emerges from a cabin door, looking out at the trees that blanket 63,000 acres of the surrounding Shawnee State Park. Over the next half hour, Patterson’s students make their way from nearby cabins into their cars to begin their work for the day. It’s spring break, and instead of jetting off for a beachside vacation, the students in Patterson’s Comparative Studies Field School class have decided to spend their break conducting immersive research in Scioto County. Together, they document contemporary local culture through interviews, photographs, ephemera and fieldnotes. Groups of two to three students are paired with a community partner who has coordinated a service-learning project for the week. Over the semester, Patterson and CFS Director Katherine Borland teach the students how to craft interview questions, use recording equipment, conduct interviews, take photographs and write field notes and observations. They discuss fieldwork ethics, particularly issues of representation. Integral to the course is learning about the role of archives in fieldwork, and each team of students codes, logs and deposits its materials into the Folklore Archives at the end of the term. Once they return to Columbus, they spend the remainder of the semester learning to make their collections accessible to future researchers.Students produce a final project — what Patterson calls “a public-facing product,” such as a photo gallery or a blog post. While on the spring break trip, students also engage in folklore fieldwork to learn about what kind of fieldworker they are — something Patterson encourages them to reflect seriously upon: When do they write best? How do they need to prepare in order to be able to listen fully? What personal frameworks and prejudices do they bring with them to the field? This reflexivity, Patterson hopes, will give her students the confidence to take on similar projects in the future. On the last day of field school, students visited the home of local renaissance man Andrew Carter, a DJ, rapper, soapmaker and community activist who runs a small animal farm east of Portsmouth. They fed alpacas, petted goats and toured his property as he shared his plans to develop a youth homesteading program. Carter will join Patterson this fall at the annual American Folklore Society meeting, where he will discuss his use of Facebook Live (go.osu.edu/watchmegrow) as a tool for community activism. The mission of the OFS is to provide students with hands-on experience documenting culture — both past and present — to understand how people maintain a sense of place in changing environments. Patterson and Borland are the enduring backbone of this effort: a service-learning and community engagement project that is not limited to the semester class. As such, they set up this multiyear research project in order to build long-term, sustainable relationships with community partners. This allows them to address community-identified needs, as well as build their archival collection, deepening and enriching it over time. “The goal is to have an integrated project that addresses the need for students to have ethnographic and fieldwork training, at the same time that it supports the community’s needs and cultivates meaningful and mutually reciprocal relationships,” Patterson said. The full Ohio Field School Collection is available at four public locations in Scioto County, including the Portsmouth Public Library, the 14th Street Community Center, Shawnee State Park office and Shawnee State University. The detailed portraits of life in Appalachia created through this work are important because this region of America tends to be misunderstood. The declaration of the opioid epidemic as a national public health emergency, and, before that, the detailing of the epidemic’s hold in places like Portsmouth in Sam Quinones’ book Dreamland: The True Tale of America’s Opiate Epidemic, brought fraught attention to places like Portsmouth. While Quinones’ book drew much-needed international attention to this issue, an unintended consequence is that the first thing most people now associate with the region is drugs. In reality, the stereotypes of Appalachia are far less compelling than the complexities on the ground, and the OFS seeks to help portray this region by engaging this complexity from the expertise of the people who know it best. The reductive view of this region and the people that live there is a sensitive subject to Scioto County residents, and many wish that outsiders had a broader view that included the recovery programs they have in place. Locals like Whitney Folsom-Lecouffe, who works at Ascend Counseling and Recovery Services, recently curated an exhibit of an art therapy project created by people in recovery. “Canary in the Coal Mine: Escaping the Opioid Crisis” provides a space to visualize the systemic nature and the personal experiences of addiction. Noting the sensitivity of these issues, Patterson and Borland developed the OFS model to embody sustained investment in the community that fosters trust through collaborative process and, in return, allows them to curate a complex, dynamic and living portrait of a place.